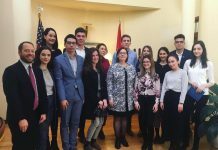 Funded by the U.S. Embassy in Kyrgyzstan and implemented by American Councils, the ‘Exchanges to Internships’ program (Etol) is currently in its fifth year. The primary aim of the program is to introduce FLEX alumni who are currently studying in Bishkek universities to government work through three-month internships at Kyrgyzstan State Ministries. At the end of the Etol internship each alumnus/a prepares a project based on his or her field of expertise and the needs of his or her particular department and community. American Councils organizes project management training workshops to further develop the Etol participants’ skills. This article describes some of the projects that FLEX alumni have organized as a follow up to the EtoI program and the professional skills that alumni have developed through EtoI. 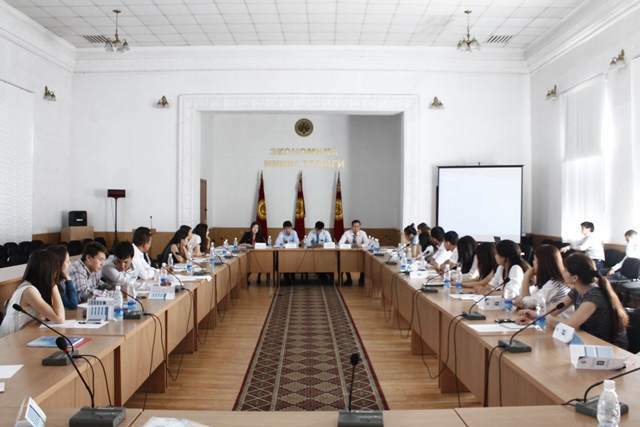 The idea to establish Etol came after American Councils in Kyrgyzstan conducted research on youth involvement in government work among FLEX alumni. The results were predictable – the vast majority of young people didn’t want to build their careers in government institutions and thought ministry work to be highly bureaucratic. This lack of interest affected both sides –state institutions, that in order to develop and reform, needed young enthusiastic people with international experience and students who, like all other citizens, were affected by government decisions. To break existing stereotypes and to connect ministries with bright university students, in March 2011 ‘Exchanges to Internships’ was launched. ‘It was difficult to convince ministries to take FLEX alumni interns. At first, heads of departments couldn’t understand how it might be useful to them as they already had long lists of candidates with experience in local and regional administration,’ says FLEX Program Specialist Irina Zaplatina. However after the first group of FLEX alumni joined the Ministries, the attitude of government officials changed drastically. Supervisors praised FLEX interns for their motivation, hard work, and language skills, which were in demand in other departments and ministries no longer hesitated about taking on new interns. Five years in, Etol is a well-known program with over 60 alumni and 32 conducted follow-on projects. Each year new ministries and departments are added to the list of possible places to intern and more alumni become interested in the program. According to Irina, every FLEX alumnus leaves the program with a completely different opinion about Ministry work with some returning to their departments after graduating from university. Two fresh Etol graduates Rakhat Sagynbek kyzy ’12 (Bishkek, Kyrgyzstan) and Zhamilia Aitkunova ’12 (Karakol, Kyrgyzstan) both feel that their recent internship experiences have contributed to their professional development and challenged their perceptions of government work. Studying Economics at the American University of Central Asia, this year Zhamilia spent three months interning at the Department of Strategic Planning in the Ministry of Economics. Having already done a number of internships in the private sector she was immediately attracted to the idea of learning more about government work. ‘I was amazed to see how different it was from the way the public sees it – there are many interesting projects implemented by talented and dynamic people who often have to juggle ten things at the same time,’ shares Zhamilia. She describes her knowledge of English as ‘her greatest advantage’. It allowed her to work with international documents and research interesting reports published for her department. ‘If I didn’t finish the task at the Ministry, I would work on it from home. It was unusual for an intern to do that and my supervisor greatly appreciated my ability to work independently. It was something I brought from America,’ points out Zhamilia. Since one of the main areas of work for her department was the transition from the UN Millennium Development Goals to sustainable economic development, she decided to dedicate her project to introducing the country’s macroeconomic strategy to university students. With the help of four departments and the Investment Promotion Agency within the Ministry, Zhamilia conducted a conference entitled ‘Students and the Ministry. Open Dialogue’. 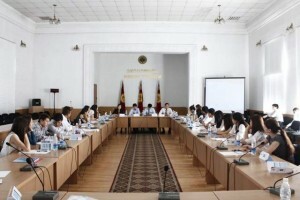 It took place in the Conference Hall of the Ministry of Economy on June 12; 30 participants from seven different universities in Bishkek took part in the event where leading specialists in the fields of investment, international cooperation, and macroeconomic policies gave presentations about their projects and later answered questions from the audience. Zhamilia’s Etol experience inspired her to combine government business with a dream career in the field of Environmental Economics. The next step in this will be receiving a Master’s degree after which she will seek employment in the Environmental Sustainability department within the same ministry. ‘I feel that this small department does extremely valuable work, but is often undervalued. I would love to contribute to its activity by helping environmental NGOs implement their projects,’ says Zhamilia. Similarly to Zhamilia, Rakhat Sagynbek kyzy ‘12 feels that her FLEX year was fundamental to her academic and professional achievements: ‘I wouldn’t be where I am now without my American experience and without the confidence and language skills that came with it. Before the U.S., I didn’t dream of anything big’. During her April-June 2015 internship at the Medical Care and Drug Policy Department at the Ministry of Health she was responsible for updating large amounts of data in accordance with changes in legislation and for processing letters and complaints. Having a sudden and big responsibility on her shoulders felt scary at times, but Rakhat felt encouraged by the support of her supervisor with whom she had daily meetings. Her knowledge of English was also in great demand in various departments within the Ministry. Rakhat translated correspondence with the European charities that sent medical equipment to Kyrgyzstan and interpreted at weekly meetings between hospitals and donors: ‘I was the only interpreter and had to translate from Kyrgyz into Russian and English. It was fun and chaotic. Everyone wanted to get involved and at times I had to simultaneously translate for three or four people speaking in three languages’. 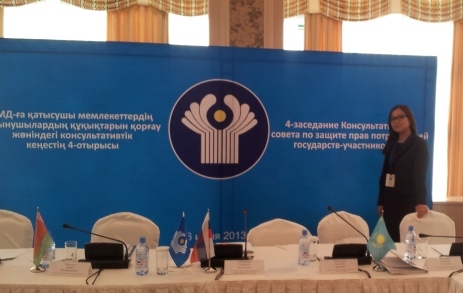 In accordance with the Ministry of Health’s nationwide campaign, Rakhat’s final Etol project was dedicated to the prevention of Measles and Rubella after a huge outbreak hit Kyrgyzstan at the beginning of this year. With the help of the Republican Center for Immunoprophylaxis, Rakhat compiled an informational booklet about measles and conducted training for 16 students of her university. One of the key elements of the Ministry’s campaign as well as Rakhat’s project was changing common misconceptions. During the training which took place on May 18, students learned about the main methods of preventing, diagnosing, and treating measles. On May 23, Rakhat took the trained group to the central square of Bishkek where they distributed 350 booklets to families and local businesses and answered questions about the developmental stages of the disease. Planning to become a plastic surgeon in the field of reconstructive surgery, Rakhat is confident that learning how the Kyrgyz national healthcare operates will be useful in her future medical career. ‘No matter what career path alumni eventually pursue, their Etol experience will prove useful. 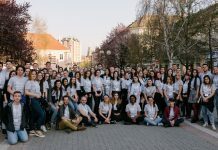 It encourages them to be more engaged in the future of their country and contribute their talent and expertise to its development,’ says Irina Zaplatina.